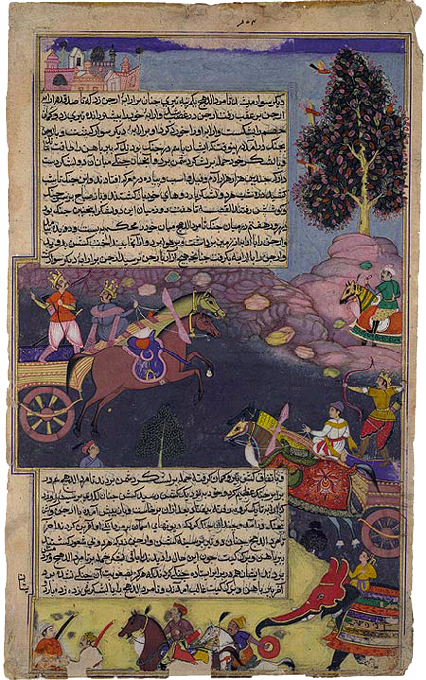 Today we continue our discussion of the Razmnama, a Persian adaptation of the Mahabharata which Emperor Akbar had produced in two richly illustrated manuscripts. The artists Akbar commissioned to create the miniatures that illustrated his Razmnama editions (two of the three originally produced) were resident painters in his royal atelier. They had been recruited from the Persian Safavid court, and worked side by side with both Indian and Central Asian artists, collaborating on the manuscript illustrations. This broad artistic influence can be seen in figures that combined traditional Vedic and Persian styles, with a hint of Mongol design. There are also Western influences found in the Razmnama illustrations, and these came as a result of the European paintings that had been acquisitioned for the Mughals' royal art collection, thus inspiring the royal artists. Akbar's interest in the culture themes depicted in the ancient Sanskrit Mahabharata no doubt had much to do with his desire to understand the Vedic art of war and India's history of dynastic succession. Like the Persian epic, Shahnama (Book of Kings), the Razmnama (Book of War) sets down the basic principles of battle, victory and defeat. 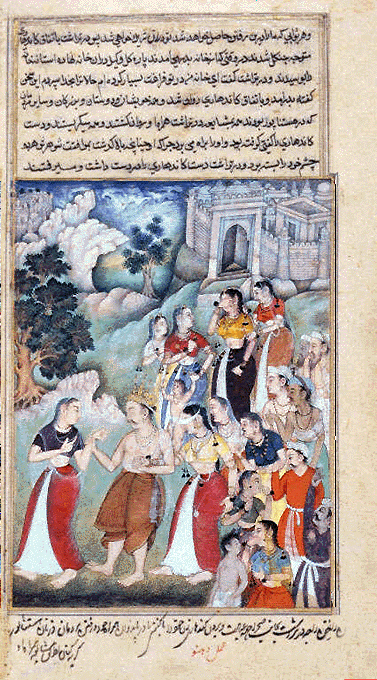 These included universal truths common to both Hinduism and Islam that Akbar was well served to understand. "At some point in the middle of the eighteenth century, two detached illustrated leaves from the manuscript entered the collection of Maharaja Sawai Pratap Singh of Jaipur (reign 1779–1803), a Hindu kingdom in the state of Rajasthan. These paintings were pasted onto large album pages, a practice that was not uncommon at this time. Indian collectors avidly amassed paintings and calligraphic specimens from a variety of sources, which were then arranged into an album format. A greatly illustrated manuscript like the 1598–99 Razmnama was particularly susceptible to such selective fragmentation as it held a veritable storehouse of images in the then much prized Mughal mode. At some point over the next several centuries, the bulk of the manuscript made its way to London, where it was sold at auction in 1921. The Razmnama's last five chapters—bound and containing 24 paintings—were auctioned off in a single lot, while the remaining 125 paintings were dispersed as single, detached leaves. It is difficult to say when precisely the manuscript was cut up. It is certain that paintings had been removed prior to this point, but when precisely the 1598–99 Razmnama underwent such thorough dismemberment is hard to pinpoint. There remains the possibility that the manuscript's paintings were excised in order to maximize profit at auction. Simply put, it was easier to sell individual paintings, the accompanying text discarded, than to sell a single, intact manuscript. This piecemeal approach to the Mughal manuscript fit well with predominant tastes at this time, as paintings were appraised as single works of art, rather than as part of a larger, bound ensemble. The sale of the Razmnama paintings at a London auction reflects the growing interest in Mughal painting among European and North American collectors. Several factors contributed to the growth in popularity of Mughal paintings in particular. First, the looting of the royal collections in Delhi, in the aftermath of the rebellion of 1857, resulted in the transport of many Mughal treasures to British soil. Second, the opening up of the Suez Canal in 1869, as well as advances in rail technology, facilitated the movement of manuscripts and other goods from India to points westward. Finally—and perhaps most importantly—the end of the nineteenth century saw a change in attitude towards Mughal painting. With the backdrop of the growing Art Nouveau movement, collectors came to re-evaluate these detailed miniatures from India in light of their craftsmanship and dynamic designs." It's quite fascinating to consider how scenes of the transcendental pastimes depicted in Mahabharata ended up traveling from India, all around the globe. 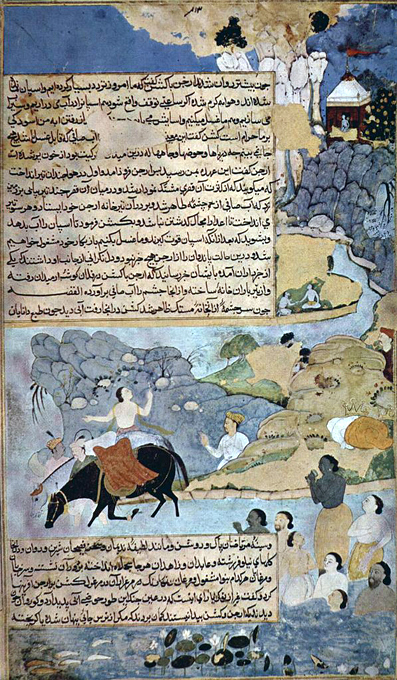 Much of the text of Razmnama, which had been adapted from Mahabharata and translated into Persian, was thrown aside, while the paintings that illustrated this great Sanskrit epic continued to be preserved and prized. 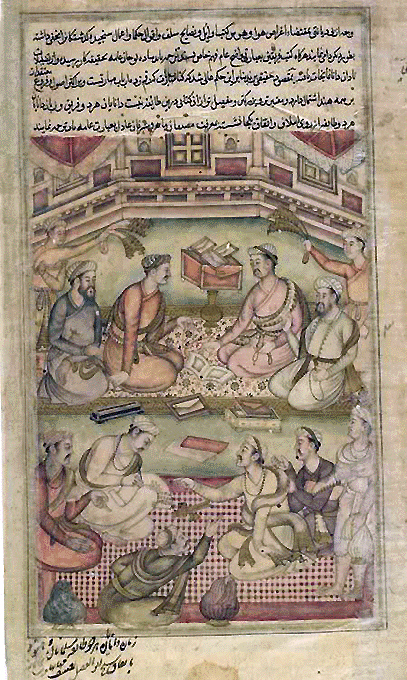 Although mundane scholars attribute the persistence of popularity enjoyed by these Razmnama illustrations to technical attributes like the style and craftsmanship of painting, there is no doubt that ultimately, it is the content of the images that have more more to do with their abiding value. These transcendental scenes are recognizable to the jiva, who is ever in contact with paramatma and able to recognize the truth of things, whether depicted in battle scenes, family vignettes, or other social, political or devotional snapshots of Vedic culture. While the appropriation of Srila Vedavyasa's epic Mahabharata by the Mughals was inspired by their desire to exploit the residents of India, the unintended result was the proliferation of these transcendental scenes throughout the world, by Krsna's arrangement.